What and how should I feed my pet? It sounds like a simple question… but is it? In reality, it’s hard to make that decision with all the tv commercials and pet store employees telling you that they are all selling the best thing. And yet, they don’t know anything about your pet! It’s not a simple formula, Choosing the right pet food depends on your pet’s age, size, lifestyle, and general health. At West Ballantyne Animal Hospital, we are here to help you make the right pet care decisions. We discuss nutrition and pet food choices at every annual Preventative Care Exam. Proper puppy and kitten care starts with nutrition and maintaining an ideal body weight. Using a proper diet will help keep your pet healthy and can prolong his or her life expectancy. Dogs and cats that are overweight or underweight may have a contributing illness and may be more susceptible to disease and injury. For example, obesity is a common complicating factor in heart conditions, arthritis, liver conditions, and other illnesses. Many gastrointestinal ailments are also linked to inadequate diets, and many skin problems have a nutritional component to them. West Ballantyne Animal Hospital carries high-quality therapeutic prescription pet food. 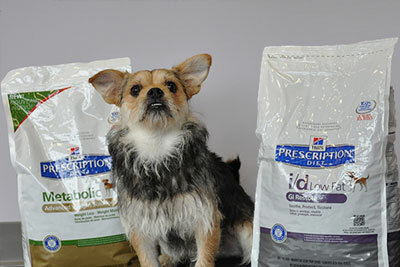 Prescription diets are specially formulated for optimal balance and nutritional support for your pet. Prescription and therapeutic diets treat and manage health conditions in pets such as obesity, diabetes, kidney disease, heart disease, liver disease, food allergies, and more. Like people, diet and nutrition is the foundation of your kitten and puppies health care. Our veterinarian will help you create a nutrition plan for your dog or cat based on his or her age, general health, and lifestyle. Call us to schedule an appointment to discuss your pet’s diet and nutrition.